I have been diligently running 3x every week since we arrived in Dayton, OR. I even have a cute, little running partner. 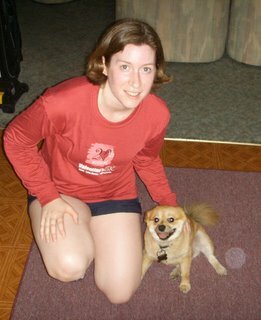 It's actually kind of fun to run with little Skipper--except when he jets out in front of me to bark at another dog. He's nearly brought me down a few times! This is a picture of us after one of our runs. Usually we run in the mornings when it is still cool out; however, one time I didn't have a chance to run until around 1 p.m. It had gotten quite warm, and it really wore Skipper out. He just laid on the dining room floor and panted and panted and panted some more!! We have been easing into our running. Next week will be our first week running more than 2 miles without any walking. I think it will be tough for both of us. I update this log after each run. It's a great tool for me.